The Bottom in Precious Metals in In! The Bottom in Precious Metals is In! One of the world’s largest miners, NEM, has shown nothing but accumulation. 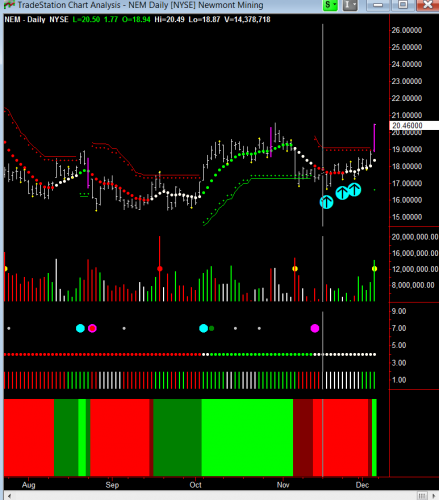 Look at the Cyan arrows I have placed on the chart, all showing higher bottoms and the rising volume… again showing accumulation. Then BANG… on Friday, Hawkeye shows a wide-bar up with confirming very high Volume Radar. 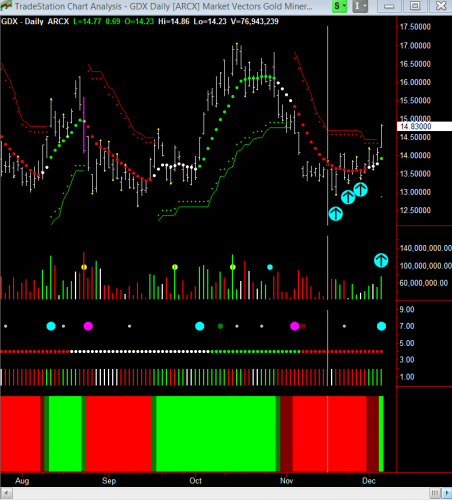 The Gold Miner’s Index, GDX (with a basket of major miners), is also showing accumulation. Again I have placed Cyan arrows on the chart showing higher Hawkeye Pivot lows, and again on the Hawkeye Volume, showing strong breakout volume on Friday. While this Gold futures chart is not quite as clear, you can still see 2 days of buying volume and a Hawkeye Pivot low on the price, all shown by the Cyan arrows I placed on the chart. 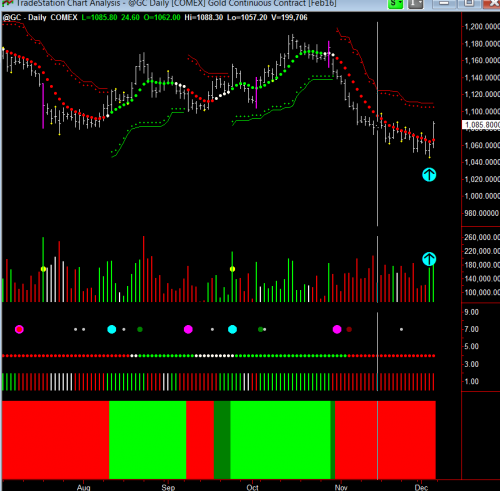 Compare with the Gold ETF – GLD. Like Gold, Silver and Platinum charts show the same profile. However, there is overhead resistance on the weekly charts to break through. So Gold will probably zig-zag in price, accumulating more volume in the process, in order to continue it’s advance through this resistance. I am excited about the prospect next year for precious metals. That’s why I will hold a Special Webinar just on this topic in January 2016. I will send an email out with registration details soon. Awesome analysis Nigel. I like how your refined Hawkeye indicators show the trend and movement direction of the markets. I would like to learn more about your system and how to trade with these systems. I’m am nee to trading, however I’m keen to learn as much as is possible from great mentor investor / traders like yourself. Thank you for all the effort that has gone into this Hawkeye systems.